Don't you hate it when you may (or may not) be trapped endlessly in a Village Inn with your ex-boyfriend and his new girlfriend, coincidentally your ex-best friend? That's the kind of day Cassandra is having. 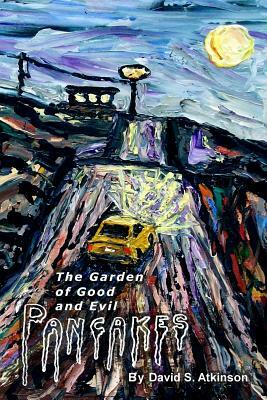 In a homogenized world that is left mostly empty so everyone can feel comfortable, The Garden of Good and Evil Pancakes explores the fictions we tell ourselves and the fictions we tell ourselves about the fictions we tell ourselves. See the trailer on EAB Publishing's YouTube page.